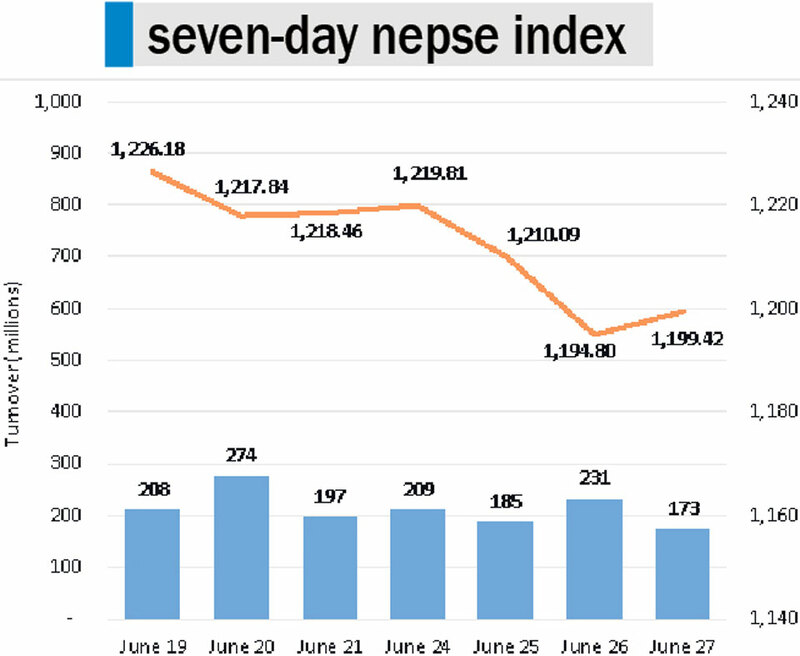 KATHMANDU, June 28: Nepal Stock Exchange (Nepse) index started momentum during mid-session on Wednesday after trading essentially fell flat for the first half. However, the market began paring the gains toward the end of the session to close fairly below the day's high. The index closed at 1,199.42 points on Wednesday, adding 4.62 points. After moving notably lower in the previous two sessions, stocks witnessed slight recovery on Wednesday while turning in another vapid market activity. 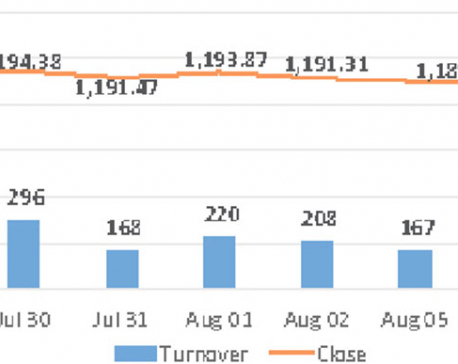 Subsequently, total turnover in the exchange hit the month-low of Rs 173 million. Reluctance still seems predominant among investors in absence of a positive outlook in the financial and economic space. Performance of major sub-indices was a mixed bag after the choppy session on Wednesday. Hotels Sub-Index rose the most and was up 1.15 percent. Meanwhile, the sub-Indices of Development Banks, Banking, Others and Finance sectors eked out tiny gains. Microfinance stocks were under pressure with its sub-index declining by 1.73 percent. Manufacturing/ Processing, Hydropower and Insurance Sub-Indices also ended the day in red. Shares of Neco Insurance Company Ltd and Mega Bank Ltd led the list of active stocks on Wednesday with turnover of over Rs 9 million each. Besides, other banking stocks followed suit with Prime Commercial Bank Ltd and Everest Bank Ltd posting turnover of over Rs 6 million each. Nepal Community Development Bank Ltd was the biggest gainer for the day as its share priced increased by 5.31 percent after hitting its all-time low on the previous day. Recently-listed Nepal Seva Laghubitta Bittiya Sanstha Ltd also saw its share price rally by about 5 percent. Additionally, Shares of Sindhu Bikas Bank Ltd and Jebils Finance Ltd recouped its previous day's losses, adding over 4 percent each. In contrast, share price of Rairang Hydropower Development Company Ltd plunged by 10 percent. NLG Insurance Company Ltd also shed over 2 percent on the day. Likewise, Unilever Nepal Ltd, Mirmire Microfinance Development Bank Ltd and Nirdhan Utthan Laghubitta Bittiya Sanstha Ltd were among the other losing scrips. In the corporate front, Western Development Bank Ltd held its annual general meeting (AGM) on Wednesday. Endorsement of 17.41 percent bonus shares to its shareholders was one of the key agendas of the meeting. As per the ARKS technical analysis model, the market snapped its two-day losing streak with a formation of a small bullish candlestick. Despite the index managing to cross the 1,200-point mark in the afternoon, it pulled back to the psychological level of 1,200 points at the end of the session. Further movement of the index at this level is key as it can point out a plausible direction for the market in the near term. Nevertheless, technical indicators like Relative Strength Index (RSI) and Moving Average Convergence/Divergence (MACD) suggest that the market sentiment is still inclined toward the bears. 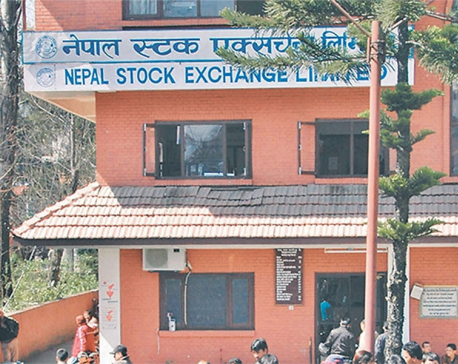 KATHMANDU, March 26: Investors are experiencing golden moment as NEPSE continues to surge for eight consecutive trading days on Sunday.